Naked Call Writing - What Does It Mean? What is the definition of the term "naked call writing"? 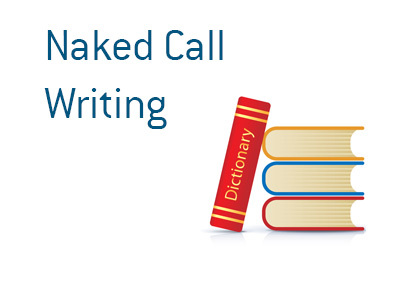 What is meant by the term "naked call writing"? In the world of trading, "naked call writing" refers to when a trade writes call options without owning the underlying stock. If a trader wants to bet that an underlying stock will increase over a specific period of time, they can buy a "call option". One call option gives the trader the right to buy 100 shares of a stock at a certain date and at a certain price. Now, on the other side of this trade, a person can also choose to write a call option. The benefit of writing options is that premium can be collected and kept if the option isn't exercised. The downside to writing naked calls, of course, comes if the stock ramps higher. For instance, let's say that a call writer decided to write out of the money calls on LinkedIn prior to their purchase by Microsoft. Guess what happens to the call options when LinkedIn trades 50% higher in afterhours trading? Many naked call writers have been blown out over time after a stock that they were writing options on was acquired or some other piece of positive news took place. There is nothing wrong with "covered calls", which occurs when an investors sells calls on a long-term position that they own. Selling naked calls, however, is an entirely different story. The selling naked calls story usually ends up in financial ruination for the inexperienced trader.